Last night some friends were dropping by with a bottle of good Merlot to see the sunset. As life has been more than hectic lately, I wasn’t up to a full-on meal. Both Greg and Jessi live in North San Luis Obispo County where hunting abides, so I pulled out a wild boar shoulder from the freezer and invented a new dish inspired by my years in North Africa. The nomads cook their tajines (also spelled tagine) with camel or goat, so wild boar seemed a logical progression. This stew was designed to eat around the bar. Instead of dipping into the sauce with chunks of bread in the North African fashion, I rolled up the shredded boar with a couple of spoonfuls of sauce in whole wheat tortillas to create a North African, Mexican Moo-Shoo wild boar. Where do you get wild boar? Either you need to hunt yourself – or have generous friends that do. In this case, a friend of a friend passed the meat to me. P.S. Our wines are listed at bottom of post. My favorite tajine dish that I purchased at IKEA for $60. Bottom is aluminum made to look like cast iron. Lid is ceramic. note: I also own a 2-persons silicon dish bought at Marshall’s for $15 plus a yellow glazed ceramic dish from Portugal ($50). There are many kinds of tajine dishes on the market now. I prefer ones with metal bottoms with one-step cooking on top of the stove. 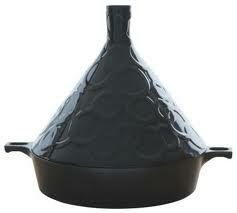 Ceramic tajines (traditional ones) do not do well for stove-top cooking. The ceramic was designed to be placed over charcoal. In Morocco, the circumference of the bottom dish fits exactly its own charcoal cooker. The web shows many pictures of ceramic dishes on a gas fire, but as I’ve had a couple dishes break while cooking, I feel obliged to caution you. If you have a ceramic or silicon dish, then I advise you to do all the sauteing in a frying pan, then transfer to tajine dish and cook in oven. The temperature should be medium heat. This stew could also be made in one of those French-style iron cookers with heavy lids (also called Dutch ovens). But I’m a firm believer that the conical lid of the tajine dish adds a dimension in savory moistness. 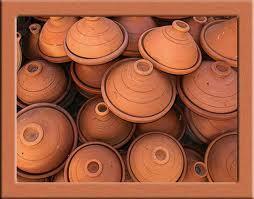 For a little history note, the Romans cooked stews in pots with conical lids. I’m wondering which came first, the Romans’ introduction into North Africa, or the Berbers teaching the Romans? Put on lid, reduce heat to low â€“ as low as possible while still cooking. Cook 3-4 hrs â€“ longer is best â€“ removing lid and turning meat chunks every 45 minutes or so for even soaking in sauce. Let sit as long as you want and reheat with lid on to serve. note: the longer the spices sit, the better they taste. The flavors meld together with time. Remove boar meat onto carving board and shred. Spoon on shredded meat, then sauce from Tajine dish. Amount of sauce subject to taste. I recommend each guest building their own. Wrap tortilla like moo shoo pork so doesnâ€™t drip. Sandra adds â€œThis is simply marvelous (ain’t it grand to love your own cooking!) if you want exotic spicing combined with the wild taste of the boar. You could use any meat, but the very long cooking is especially good for tougher cuts. SUGGESTED WINES: We started with EOS Estate Merlot, Sonoma, Â 2009 and finished with Red Carpet Pinot Noir, Santa Maria Valley, 2011.